Dr. Peterson grew up in New Prague, MN. He attended the University of Minnesota, Duluth for his undergraduate education and then graduated from the University of Minnesota, School of Dentistry in 2003. 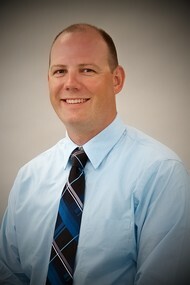 Dr. Peterson and his family have been in the Cambridge, MN area since he graduated from dental school. Dr. Peterson takes great pride in providing the most comfortable and up-to-date treatment available. He is passionate about offering new, innovative treatment options such as laser dentistry, porcelain veneers, and dental implants. Dr. Peterson has taken extensive training in dental implants & laser technology. He has been placing dental implants and utilizing laser technology since 2008. Dr. Peterson has been provided same-day crowns through Cerec technology since 2011. In 2013 Dr. Peterson took a CBCT advanced imaging course which now allows him to place dental implants in an exact pre-planned position based on a patients 3D radiograph.